Family owned and operated. Our company was established in 1984 and has been responsible for providing outstanding service ever since. A few of the services we provide are: Carpet cleaning, upholstery cleaning, water extraction, water & mold damage restoration, and odor control such as urine, smoke and mildew. THE CARPET CLEANING COMPANY FOR THE CENTRAL OREGON COAST. SERVING LINCOLN & SOUTH TILLAMOOK COUNTIES--SEVEN DAYS A WEEK! Your call is important to us. We always do our best to connect your call to a person, not a machine. Even after 5:00 and on weekends. 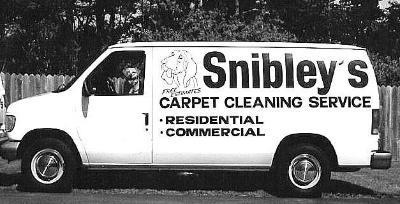 Snibley's Carpet Cleaning Service, Owned and operated by Wesley Brown, was founded in 1984. From its modest beginning with a portable carpet cleaning machine and vacuum cleaner, Snibley's Carpet Cleaning Service has grown to become one of the largest Carpet Cleaning firms on the Oregon Coast. HOW DID THE SNIBLEY NAME COME INTO BEING WHEN WES' LAST NAME IS BROWN? Wesley did not think that Brown's Carpet Cleaning sounded too attractive, so he was looking for an alternative. At the time, there was a cartoon on television about a grumpy old man named Snibley. One day some children next door called him Snibley, and it just stuck with him. The logo of a crying basset hound soon followed, and that has become a popular and familiar sight in Lincoln and South Tillamook County. We do our best to deliver a high quality dependable service. At Snibley's we believe that it is important to always continue our education and stay informed about the latest equipment and products so that our customers will receive top of the line service. We welcome your comments, both compliments and complaints. We want our customers to tell us what we need to improve and what we should never change. Please send your suggestions, complaints and compliments to Management@SnibleysCarpetCleaning.com .